Bry-Air participated in Asia Labex held from 19-21 April 2018 at Chennai. The 3 day exhibition focused on the latest laboratory technology, advancement and automation available across the globe. Exhibitors from Diagnostic & Life Sciences Instruments, Testing Instruments, Fine Chemicals, Analytical & Scientific Instruments, Clean Room Equipments, Consumables etc. were present at the show displaying their respective products and services. Bry-Air put up a stall to engage, network and build new business contacts with the visitors who came from varied industries like Chemicals, Pharmaceuticals, Fertilizers, Food & Beverages , Diagnostics, Petrochemicals, Research Institutes, Universities, Government Bodies, etc. 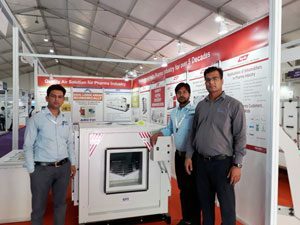 Here we displayed FFB series of Dehumidifiers which attracts visitor from all testing laboratory across several sector like Chemical, Petrochemicals, Fertilizer, Pesticide, Food & beverage, Material Testing and Diagnostic- Path Labs, Pharma- CRO, Research Institution, University. Besides, reiterating and educating clients on the moisture nuances in Laboratories, Bry-Air representative, A. Janarthana Rao presented to the audience at “Labotica 2018” conference (held at the backdrop of the exhibition) on “Next Generation Desiccant Dehumidifiers for Pharma and Biotech”. He enlightened the serious audience on the latest and upcoming technologies in the field of dehumidifers and Bry-Air’s credibility as a leader and long term solution provider in the air treatment environment and across the laboratories industry. Bry-Air Airgineers were seen actively engaging several contractors, consultants and end users visiting our booth for understanding and getting quick solutions for their humidity and moisture control needs.